Basilica Birnau with its unique place above the lake was built in the years 1746 to 1750. It was built by the Voralberg master builder Peter Thumb. 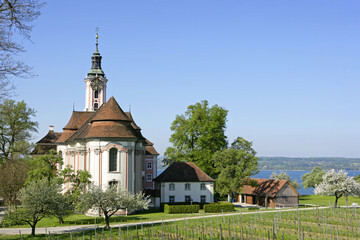 The picturesque view from the church to the headland of the ship dock in Unteruhldingen, the Mainau and the lake make the church Birnau one of the most unusual rococo creations in southern Germany. Birnau was named Basilica minor by Pope Paul VI in 1971 and the choir faces north. It was found that the magnificent façade needed the lake shore as a suitable “parterre”. Today there is a large terrace in front of the façade with a wonderful view over the entire Überlingen lake and up to the peaks of the Swiss mountains Säntis, Altmann and Churfirsten. Birnau is certainly the most beautiful and impressive church on Bodensee Germany.